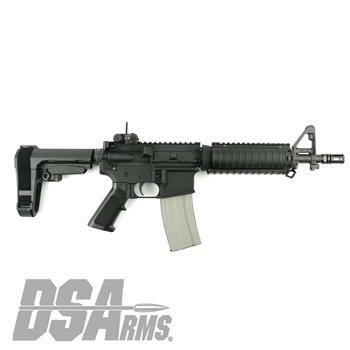 The DSArms Service Series of firearms feature civilian legal semi-automatic variants of iconic US Military issued firearms in both rifle and pistol versions. The DSArms Service Series of firearms is not only a very affordable option to own a semi-automatic version of a US military issued firearm, but it is also built with the same care and quality as seen in the real issued versions of these iconic firearms. These semi-automatic versions are chambered in 5.56x45mm NATO and feature forged 7075T6 upper and lower receivers and a military grade steel 1:7 twist chrome-lined barrel. Each variant is outfitted with the correct accessories as seen on the real issued US Military issued versions. This is your chance to own and experience these iconic firearms whether at the range or on display. Manufactured by DSArms - All parts U.S. Made! Also available for LE and Military sales in select fire and S.B.R. versions - NFA rules apply.